In an unexpected treat for the audience, the Zang Toi Spring 2014 show opened with a short performance down the runway from Cory Stearns, the principal dancer of American Ballet Theatre. This graceful solo set the tone for Toi’s collection, cheekily named “Ballet Babe” after the designer’s handsome muse for the season, which featured the use of fluid custom Loro Piana silk jerseys and cashmere tweeds. The silk jersey was used to dramatic effect in the first ballgown shown, with black pleated tulle tufting out from the shoulder and along the edges of the square cutout back, as well as in layers frothing outward from a front slit in the gently-swaying navy skirt. “This collection is all about the movement: the beautiful, graceful, very elegant movement of the ballet dancer,” Toi told Meniscus Magazine backstage before the show. Elements inspired by the ballet appeared in various forms throughout the collection, but the best manifestations were in the usage of floral appliques and tulle ruffles and overlays, as well as the detailed baroque design in shades of blue appropriately called the “Ballet Scene Backdrop” print. For the past two seasons, Toi has excelled at creating luxurious capes or coats featuring beautiful printed lining or embroidery that only the lucky woman wearing the work would be aware of. 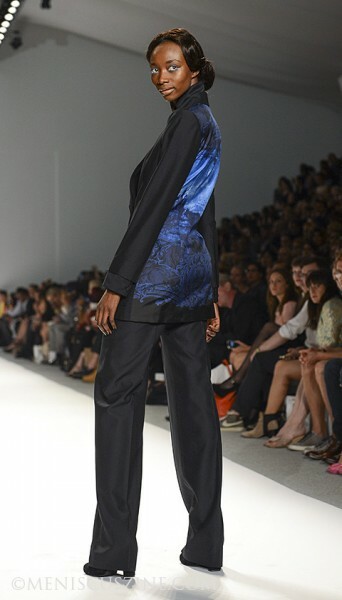 Spring 2014 was no exception, where he showed a black silk shantung sculpted coat lined with the “Ballet Scene Backdrop” print in silk twill. 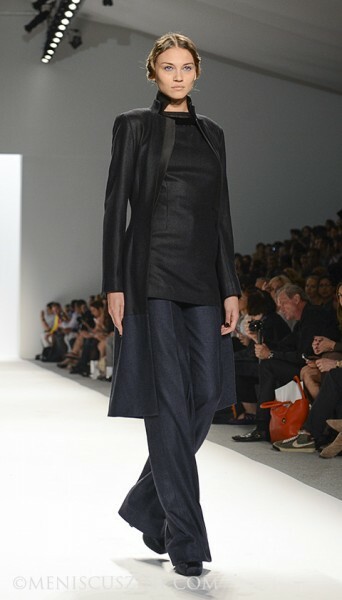 This was dramatically worn open wide (all the better to show off the design) with a matching black silk shantung peak lapel blouse and lean trousers. For all the femininity associated with the ballet, there were very few looks that were actually over-the-top precious. Surprisingly, the color palette was tightly edited to black, navy, light blue and pink, with the majority of the clothes shown in either black or navy. In addition, several masculine suits were featured. They were all well-tailored, with the standout being a blazer and trouser set made from black Loro Piana cashmere and silk tweed. The blazer innovatively had an attached black silk gazar shirt. This balance prevented the show from becoming saccharine and gave it the level of sophistication worthy of the brand. Fans of Toi’s work who do not have the luxury of popping into one of his boutiques in Malaysia can now order pieces from his new e-commerce site, www.shopzangtoi.com. Launched in conjunction with New York Fashion Week, the site features his Classics knit line (amongst other products), which starts at a lower price point than his runway work.